I love to serve souffles for dessert. Not only are the flavors in this recipe especially intense — rum, coffee and cocoa — but the presentation is always greeted with smiles from my guests. I think souffles have the reputation of being very difficult to execute; this recipe makes it easy. Intense flavors -- rum, cocoa and coffee -- are the 21st century hallmarks of this traditional French dessert. 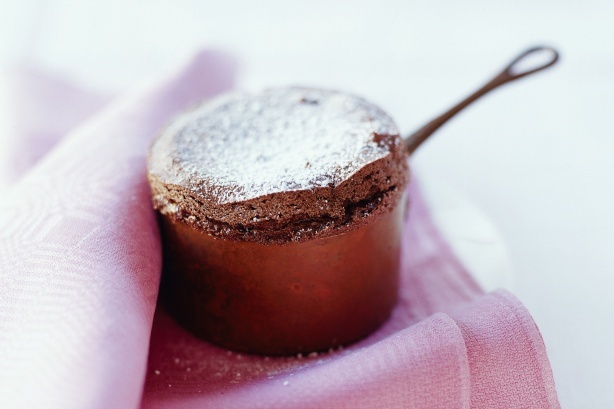 Few desserts are as impressive as a souffle and this recipe is surprisingly easy to make. Place baking sheet in oven to heat. Grease six 8 oz souffle dishes with melted butter. In a small bow, mix 1 tsp of the Omanhene Natural Cocoa Powder with 1 tsp of sugar. Tip this mixture into each of the souffle dishes in turn, rotating each dish so the inside is evenly coated. In a medium bowl, mix the remaining cocoa powder with the coffee and rum. In a clean, grease-free bowl, whisk the egg whites until they form peaks. Add the remaining sugar and whisk. Stir a spoonful of the egg white mixture into the cocoa, coffee and rum mixture. Then fold in the remaining egg whites. Spoon the mixture into the prepared souffle dishes, smoothing the top with the back of a spoon or a spatula. Place souffle dishes on the hot baking sheet. Bake for 12-15 minutes or until well risen. This entry was posted in Omanhene Chocolate Recipes and tagged Cocoa Powder, coffee, Recipes on October 6, 2011 by Steve Wallace.